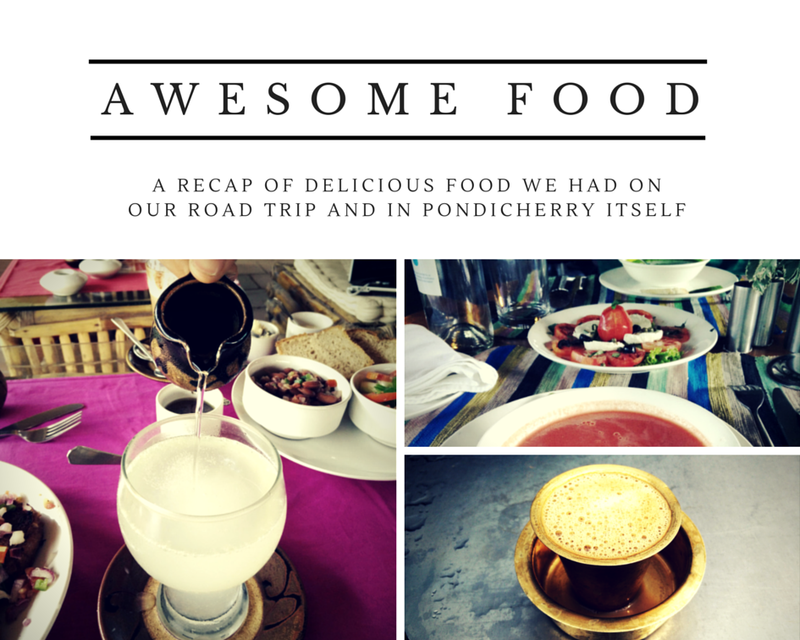 We are still recovering from our road trip as well as the tasty goodness of Pondicherry. Both of us feel like all we did was eat at Pondicherry. It is not like we went on a rampage, we ate three meals but those were much more lavish and expansive than our regular one dosa each fare. 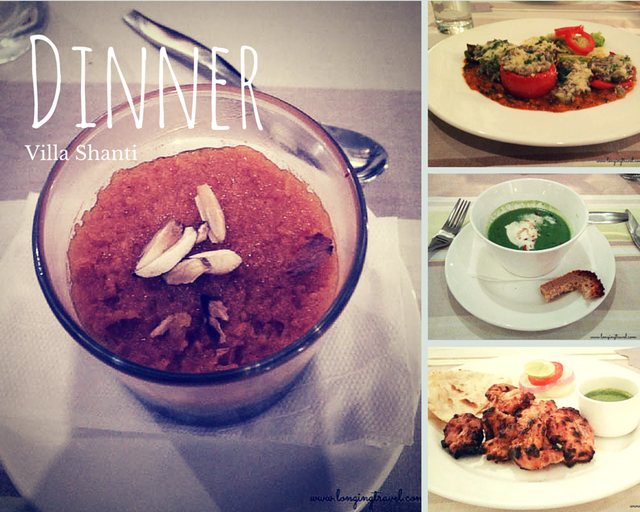 Here are some of the best food we had the pleasure to enjoy. There are many more pics to see, head over to our FB page or follow us on Instagram. 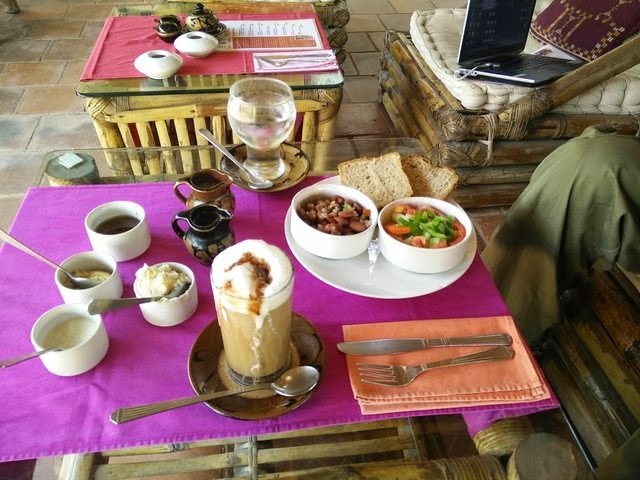 Our foodie friends might find the pictures lacking but believe me for some reason the SLR around our necks does not get clicking on a table with food. Infact these are some of the rare pictures of food you would find here, because we forget clicking as soon as we see food. 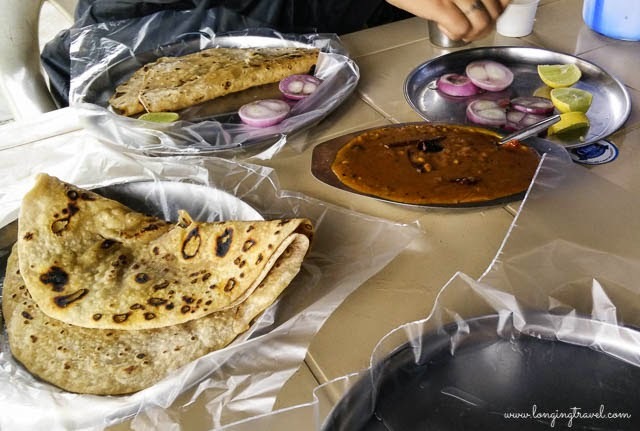 We had no inclination to click filling breakfasts we had at Chitoor and Vellore while riding, the truth is posting the food here was the last thought on our mind. So as you would know we started off on our bike at 11:40 am (too late) lunch on the highway was our first pit stop and the food was great. Dal, chapati and egg bhurji made for a hot and satisfying meal in the rainy afternoon and we spent close to an hour just resting our vibrating selves and letting our bike cool down while we gobbled up all the food. 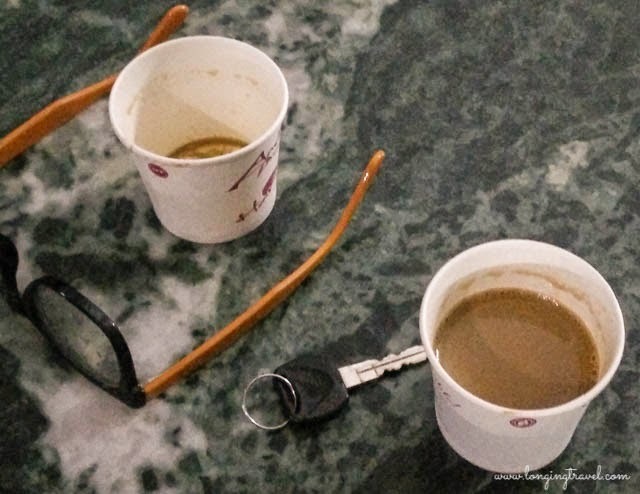 This is the tea which marked our entry in the city of Kadapa and what a ride it was. Dripping from rain and shivering this came as a welcome relief even though it was probably the most expensive tea we had. 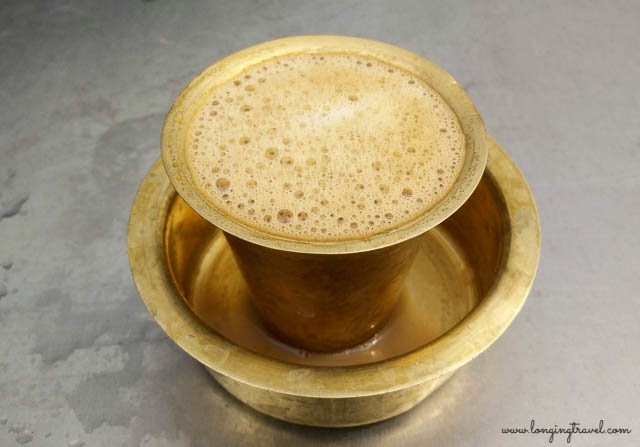 You know the feeling when you can just taste victory, this filter coffee was exactly that. Some 40 Km from Pondicherry after crossing Thindivanam. Ajay saw this place which had a toilet. We were again wet from the rain and hassled from crossing one city after another; bursting bladder didn't help much either. As I used the facilities Ajay ordered this awesome cup of coffee and it was heavenly. Don't ask me how it compares to the famous coffee houses because right then it was the best coffee ever. After sleeping for a while at our host's place we decided it was time for dinner as our lunch hadn't really been filling. TripAdvisor said Villa Shanti was the place to be and it was Ajay's birthday so that is where we went and food was great. Next day we woke up a bit late and headed to Kasha Ki Asha which is definitely a place we both liked and enjoyed. Our food was as colorful as the place itself and I love the way they serve lemon soda. Moving on we were off to keep our date with Dune, where Subhajit waited for us to give us a property tour as well as feed us some good food. Ajay loved the watermelon gazpacho while I favor my stuffed spinach ravioli. If I could have finished it I would have ordered their Ayurvedic fare but that platter was so much food that it took and entire paragraph in the menu. 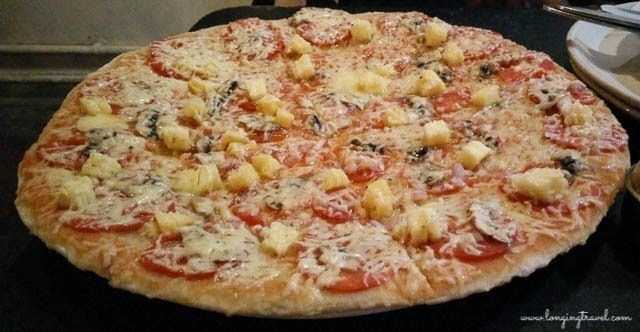 This brought us to the dinner which was pizza in one of the famous restaurants of Pondicherry- La Terrasse. Though I like the pizza it was a bit bland for us (I know Indian taste buds) surprisingly so because we had asked for a spicy version. Last year we had one near Auroville and that is still my favorite. I just have this one pic of our lunch next day which is a surprise because we were famished. I guess blogging is catching up with me, otherwise it is difficult for me to stop and take a picture when food is on the table. This is at Sher-E-Punjab Dhaba at Nandayal; there are quite a few of them. This one was next to a petrol pump and also has toilets. We feel we ate too much, but I am not complaining. Food was good, though we did eat expensive fare than our usual meals. Before I sign off there is nothing like hot parotha and Kurma to make you feel satisfied. Pondicherry is one of the places I have had some of the best parothas, Try it at any shop they they usually cost you 10 a piece and Kurma is kind of complimentary. 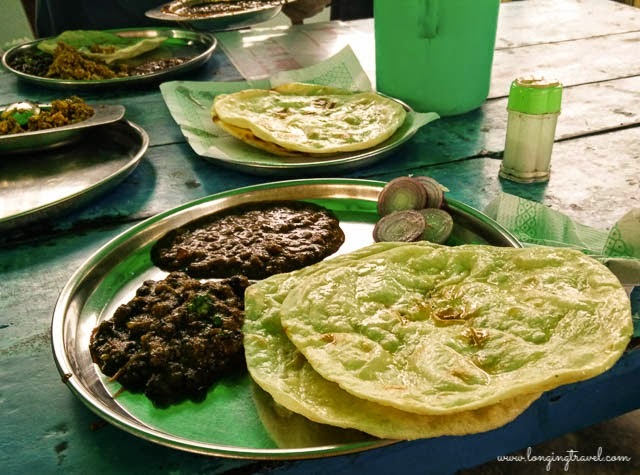 If you are a vegetarian like me you will struggle to total 30 for a meal of Parotha Kurma. 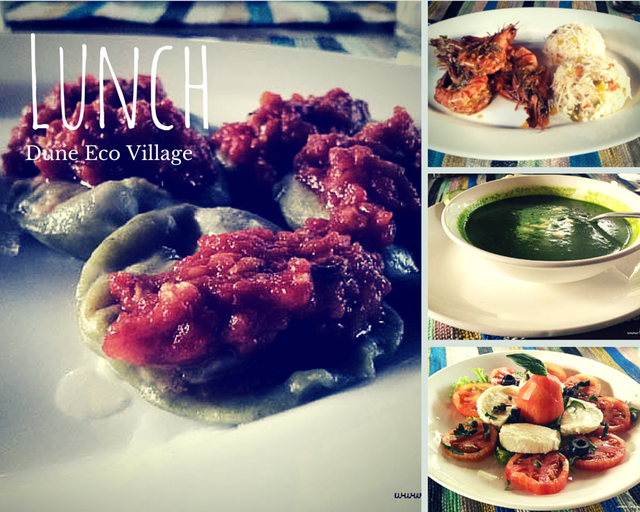 Hold on let us know what are your favorite places to eat in Pondicherry and the best highway meal you have ever had. Feel free to share pics. Yum! Looks so good. Thanks for sharing the details and photos.